(TibetanReview.net, Jan31’19) – What is wrong with Tibetan children being taught their own language by monks in monasteries in free classes during school holiday? Well, it amounts to “ideological infiltration among the young” and is “dangerous” and “harmful”, according to the Chinese government, which has banned it, said New York-based Human Rights Watch in a new report Jan 30. 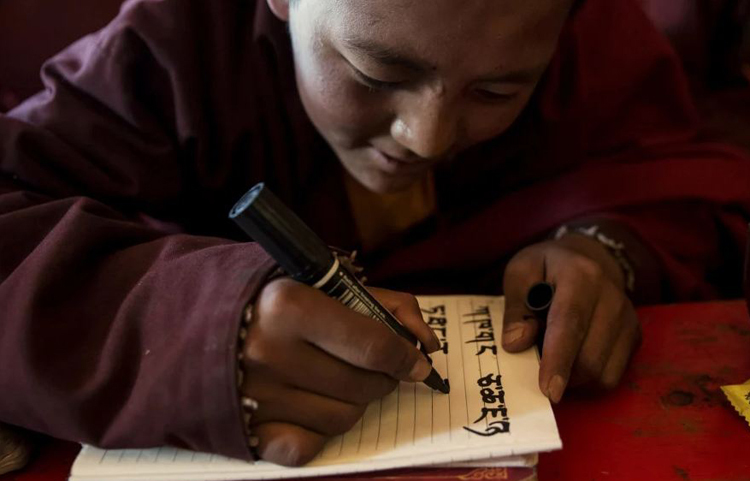 Tibetan language is used progressively less in many government-run schools and informal classes taught by monks during school holidays have become popular in Tibetan areas, particularly to teach the Tibetan language, the report said. The report said that the ban was published in Nangchen (Chinese: Nangqian) County of Qinghai Province in Dec 2018 and titled as “Urgent notice concerning stopping illegal study classes in monasteries”. It is said to call on local officials and Chinese Communist Party cadres responsible for managing monasteries to “understand the harmful nature of monasteries running open schools,” and to stop them from doing so. The group said the Nangchen ban, of which it had obtained a copy, conformed with earlier reports of similar bans in Tibetan areas. The group said the language used in the ban order suggested that officials were trying to stop schoolchildren from having contact with monks for even non-religious activities such as classes in Tibetan language while also attempting to restrict children’s religious activities. Such religious restrictions were earlier seen applied to schools in Tibet Autonomous Region (TAR). The report noted that the ban on Tibetan children from religious activities was the first known document issued directly by the Communist Party’s United Front Work Department, which oversees policy concerning minorities. It said previous bans on children attending religious activities had been issued by individual schools or the local education bureau. And a notice issued by an upper middle school in Lhasa, dated Aug 23, 2018, was stated to have required parents to sign a compulsory “responsibility agreement” stating that “students must be stopped from attending various religious activities” during the school holidays. The report pointed out that China was implementing such restrictions despite having ratified the international conventions guaranteeing its citizens’ right to freedom of religious belief and this rights being specifically enshrined in its own constitution. The Chinese government was also noted to have legally promised not to deny children who belong to an ethnic, religious, or linguistic minority the right to enjoy their culture, profess and practice their religion, and to use their own language.